Tis the season for holiday travel, crowded airports, weather delays, understaffed airlines, first timers and stressed out flyers. The best advice is “be prepared” for it all. Think it through, fly smart! We’ve compiled a few helpful lists with tips to get you started. The rest is up to you. Again, the best advice is “know before you go” and “be prepared”. Have we left anything out? How do you survive holiday travel? Add your tips below! Before snuggling up with a plane blanket or tying a ribbon to your bag, read these tips. Know the difference between “direct” and “nonstop” flights, and always opt for the latter.Unlike nonstops, direct flights can touch down at other airports on the way to their ultimate destinations, says Macon Dunnagan, a baggage handler with US Airways. And while stops are built in to the total travel time, the potential delays they can cause aren’t. Select your seats ASAP. “If you have a disability and need a premium seat in the bulkhead, tell the agent when you make your reservation rather than at the airport,” says David Martin, a Delta passenger-service specialist who creates the airline’s policies for customers with disabilities. Other passengers might be able to nab those seats 24 hours before the flight, when they’re made available to everyone through the airline’s website. 1. Before you fly go for a walk if possible to get some fresh air and sunshine (weather permitting). Do try and get a good night’s sleep before travel. 2. Stay calm and relaxed. 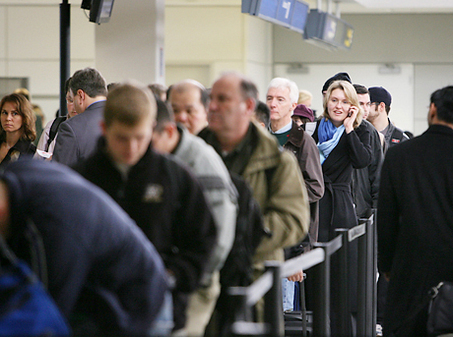 Get to the airport in good time and try to remain calm during the check-in and security procedures. Try to breathe deeply and relax both before boarding and once on board the aircraft. Put a drop of lavender oil on your temples and wrists to help with relaxation.1. Before you fly go for a walk if possible to get some fresh air and sunshine (weather permitting). Do try and get a good night’s sleep before travel. TSA and our security partners conducted extensive explosives testing since August 10, 2006 and determined that liquids, aerosols and gels, in limited quantities, are safe to bring aboard an aircraft. The one bag limit per traveler limits the total amount each traveler can bring. Consolidating the bottles into one bag and X-raying them separately from the carry-on bag enables security officers to quickly clear the items. Once you get to your location, I’d suggest checking for services like the ones provided at http://www.weinerestates.com/, this because sometimes you can save up a lot more just by using a mobile home instead of hotels. 2. Check as many pieces of luggage as possible to avoid overloading yourself. 3. Remember that your child will have to be taken out of the stroller when you go through security. 4. When you check in, tell the desk attendant you are traveling with a baby. Let her know if you have a stroller or carseat with you and let her know that you actually have the services fro you car from http://www.atloceanside.com waiting for you in the airport. 5. Change your baby’s diaper immediately before boarding the airplane. 6. Avoid breast- or bottle-feeding your baby just before boarding as he may fall asleep and wake up crying as you struggle to carry him and your belongings to the gate. Wait until you are seated and unloaded, then feed him and maybe he’ll take a nap. Saving food and drink for when you’re on the airplane is also a great way to keep older infants entertained. 7. Whenever possible, check your stroller at the gate just prior to boarding so you don’t have to carry your infant through the airport. 8. If traveling with two adults and multiple children, ask if one adult can do early-boarding to set up while the other adult gives your little ones a chance for some last-minute exercise before boarding. Many airlines, including all of the major U.S. airlines, allow children as young as five to travel alone. In addition to the usual risks that come with flying, there are additional risks that are associated with children flying alone. Many of these risks can be overcome by using common sense and taking a few basic precautions. The following tips will help both children traveling solo and those responsible for the child to deal with many of the problems that may be encountered. ← Selling on-board ad space big money for airlines, but when is it too much?